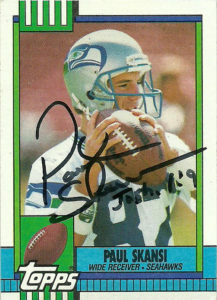 Paul Skansi is an interesting figure in the history of Seahawks football. I always viewed him as an important participant and observer in the growth of the sport that always seemed to fly under the radar. Skansi is a member of Seahawks- or as I knew them- the pink clad Seattle Knights of Tecmo Bowl. He then returned to play in Tecmo Super Bowl as well. In the midst of this, as the great card rush occurred during the late 80s and 90s, Skansi had numerous football cards of him produced. Now as a key role player for the team, it was surprising that Topps, Score, and even Action Packed produced cards of the tenacious receiver- but ProSet (the biggest card set of the market) did not. I remember him in that first pack of Action Packed I ever opened, because his name is so unique. Paul, with his impressive hands and fearless and precise route running, was quite the find for the Seahawks. A local product from the University of Washington, he was a Steve Pelluer favorite. He helped the Huskies win an improbable and exciting Apple Cup with his circus TD catch in 1981. He’d conclude his career at the college with 161 receptions – which still ranks 5th all time on the school’s record books. Originally a 5th round pick of the Steelers in 1983, he found himself on his hometown Seahawks by 1984. There he became a valued and fearless slot man that was counted on for numerous first downs to keep the chains moving. While he was always overshadowed by the likes of Brian Blades and Steve Largent, Skansi worked best in 3rd down situations. Initially he also saw time on punt return duties as well. 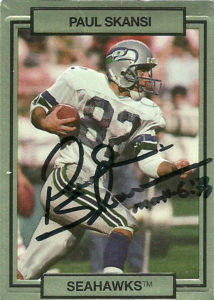 He’d play the next 7 seasons in Seattle, and then briefly try his hand in the CFL with the Ottawa Rough Riders in 1992. Skansi’s shining moment came in a thrilling matchup against the Kansas City Chiefs in 1990. As Derrick Thomas played havoc with the Seahawks offensive line all day, Seattle’s offense hung around. In the closing moments trailing 16-10, quarterback Dave Kreig threw a bullet over the middle for 25 yards to Paul for the winning TD. Paul since his playing days has done a lot of coaching and scouting. After coaching his way through the college ranks, Skansi has joined the Chargers where he’s been a scout for the last 17 years. He lives outside of Seattle, and always loves to talk Huskies football. He was kind enough to write testaments on all his cards. He also enclosed a nice note thanking me for writing him. 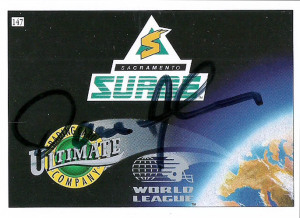 As always, players like Paul are the ones I love to get the autographs from, as they always add to the memory I already have of them. Tom Clements has garnered quite the reputation over the last few years working as a quarterback whisperer for the Green Bay Packers tutoring the likes of Aaron Rodgers and Brett Favre, while also getting the best out of other names such as Kelly Holcomb, Kordell Stewart, Tommy Maddox, Elvis Grbac, and Jake Delhomme at his other stops. Being a former HoF QB in the CFL, has given Clements an edge over his coaching competitors. Some say it is his calm and easy going demeanor during gameday, or the a way of always getting a little bit more out of his quarterbacks. Regardless, Clements is praised in circles around the NFL as an up and coming coach. 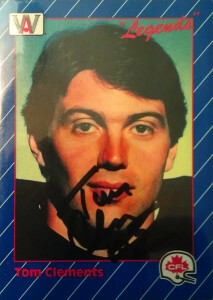 Tom Clements was inducted into the Canadian Football League’s Hall of Fame in 1994, after a prolific career playing for the Ottawa Rough Riders (1975-78) where he was named the CFL’s Rookie of the Year in 1975. In 1976, Tom earned his first Grey Cup Championship earning the Outstanding Offensive Player award. He joined Saskatchewan and later Hamilton in 1979, before a brief foray into the NFL in 1980 with the Chiefs. 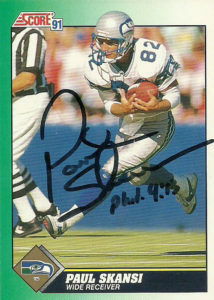 Returning to the Tiger Cats in 1981, he’d play there through the 1982 season and then join the Winnipeg Blue Bombers. He’d earn his second Grey Cup Championship and Outstanding Offensive Player of the game award in 1984, and league MVP honors in 1987 retiring after the conclusion of the season. He’s also had a stop at his Alma Mater Notre Dame, before making the leap to the NFL as a position coach and offensive coordinator for the Saints (1997-1999), Chiefs (2000), Steelers (2001-2003), and Bills (2004-2005), before joining the Packers in 2006. The Packers are well aware of Clements reputation as he has steadily risen in the organization’s coaching hierarchy. Although embattled after the 2015 campaign, Clements serves as the Packers Offensive Coordinator and Associate Head Coach going into the 2016 season.